Atlantic Beach's #1 source for Fun. We will open on May 11th. At AB Watersports we provide you with late model Yamaha VSDLX Wave Runners for an up close experience on the water, each Wave Runner can accommodate 3 riders at a time or 375 lbs. These adventures may be the best time you have on vacation, so book today to secure your reservation. AB Watersports offers parasailing along the Crystal Coast in our 35′ parasailing boat with all new chutes and equipment for 2018. USCG approved Captain and equipment will ensure a day of high flying adventure on the Crystal Coast. You will be Flyin High on your adventure at AB Watersports. Call today to start your adventure along the Crystal Coast. Grab the family and enjoy a day on the beautiful waters of the Crystal Coast. Choose between a half day or full day excursion and go explore the coastal waterways, find an island to hunt for seashells or take a slow cruise along the Morehead waterfront and grab lunch on the waterfront. Pontoon Boats and flat bottom skiff are available. AB Watersports is the premier water sports provider in Atlantic Beach, NC serving the visitors of the Crystal Coast; we carry late model Yamaha Jet Skis, Pontoon Boats, Kayaks, Paddleboards, and Parasailing on our 35’ custom boat. At AB Watersports we pride ourselves on our outstanding customer service. Check our reviews out on TripAdvisor, were the #1 rated water sports adventure in the area. If you don’t want to “Fly High” or “Go Fast” here are some other fun options. 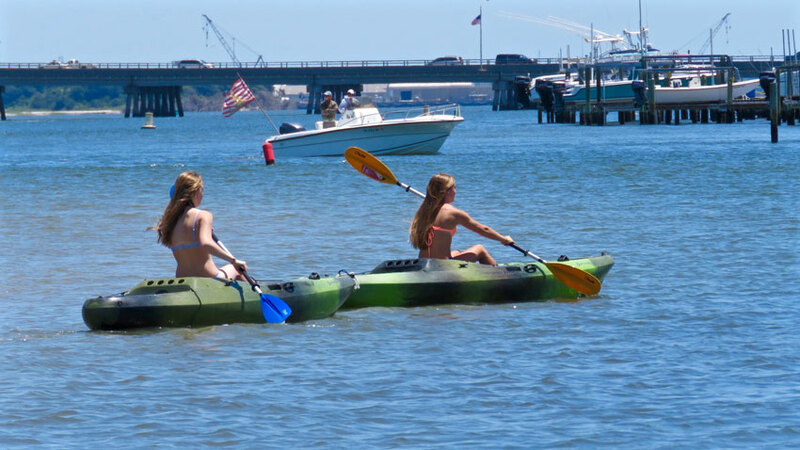 Enjoy the Crystal Coast and the secluded waterways only a kayak can venture into along with tidal marshes and cutbanks all along the Crystal Coast. You can rent a single or double for either a 3 hour adventure or an all day outing. Call today to arrange a time. 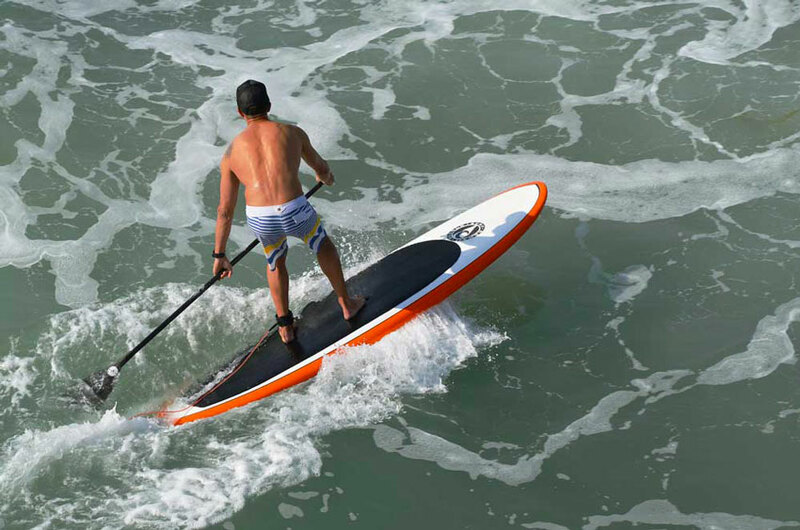 Paddleboarding (SUP) is one of the most serene ways to see the Crystal Coast and the beautiful waterways it offers, and the whole family can enjoy this outing. Enjoy an afternoon of paddling the Crystal Coast. Need a little more speed for cruising the Crystal Coast or just want to get on the fish faster? Rent our 19 foot, Southern Skiff with 70HP Suzuki on the back. Complete with T-Top and bimini top for complete comfort, rod holders, and all safety equipment needed. USCG certified. We offer Delivery & Pick Up for full day kayak rentals. Check out our rates. Local delivery is free. We can accommodate the whole family for a day of fun and we feature the largest riding area around. Look to AB Watersports to elevate your Crystal Coast vacation and taking advantage of everything the Outer Banks has to offer. Contact us at (252) 422-0520 to get started on the basics with SUP lessons and paddleboard yoga classes, discover the coast on a kayak tour, explore the waterways on a Jet Ski rental, or soar to new heights while parasailing. We’ve got you covered for fun on the coast and then some. We’re located right on the waterway for the fastest access to the fun. AB Watersports, where fun and family come together for good times on the Crystal Coast.